The volumetrics diet described in The Diet Denominator is written by Frank Bottone, a licensed dietitian and author of numerous academic research papers and health-related articles in medical journals and magazines. Frank Bottone says that “the key to weight loss is good nutrition and the key to good nutrition is education”. He emphasizes that while many of the latest diet plans do focus on educating dieters they are often too complicated or overly scientific, which makes them impossible to follow. The Diet Denominator addresses this by providing dieters with any easy to use food evaluation tool that makes it simple to select foods that will support your weight loss goals. The Diet Denominator is based on the principle of Volumetrics, which involves selecting foods that have a high volume but a low amount of calories. In this approach it is not the amount of food you eat that is important but rather its energy density. As such by using this method you can eat the same or even more volume of food as usual, while consuming fewer calories. The foundation of the plan is the Diet Denominator tool, which makes it easy to choose low energy foods. Using this tool foods are categorized on a scale between 0 and 9, where the foods with the highest energy density have the highest value on the scale. For example, butter has a score of 9 and water has a value of 0. Bottone explains that the average value of ordinary food items from the grocery store is about 2.5. If you want to lose weight your goal is to consume foods that are at or below this volumetric. If you feel the need to eat something outside of your volumetrics diet plan, or if you are in a situation where there are limited food choices, you are advised to select a food that is closest to a Diet Denominator value of 3. In this way you won’t cause major damage to your progress. Fruit, vegetables, turkey, tuna, trout, lean beef, chicken, eggs, avocado, pinto beans, brown rice, pasta, oatmeal, cottage cheese, low-fat yogurt, reduced-fat sour cream, instant pudding, ketchup. The Diet Denominator involves a food evaluation system based on volumetrics and does not address exercise. The Diet Denominator: Fill Your Tank for Less. 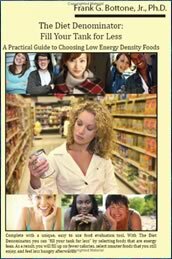 A practical guide to choosing low energy density foods retails at $14.95. Encourages the intake of foods that are high in nutrients and low in calories. Flexible and allows dieters to choose food according to their preferences. Not overly restrictive and can be adjusted to suit individual needs. No need to count calories. Includes a list of fast foods with a Diet Denominator below 2.5. Author’s website has an online tool to help you calculate the volumetrics of foods. Volumetrics concepts are based on scientific research. Author is a qualified nutritionist. Requires time to be spent on calculating and planning daily food intake. Encourages the consumption of fast foods. Emphasizes volumetrics above the nutritional value of food. Does not address the psychological factors involved in weight management. The Diet Denominator is based on the principle of Volumetrics, which makes it easy for dieters to consume fewer calories while at the same time eating foods that make them feel satisfied. While some attention is given to food quality in the book, the Diet Denominator score is emphasized rather than the nutritional quality of the food. For the most part the foods with a low score are also generally high in nutrients such as fruit and vegetables, however it is possible for less healthy foods, such as low-fat ice cream and fast food nachos, to have an acceptable score in this system. If dieters remain aware and make healthy choices, a volumetrics based diet can be a sustainable lifestyle plan that will enable dieters to lose weight and improve their health. Volumetrics is a term coined from the book The Volumetrics Weight-Control Plan : Feel Full on Fewer Calories by Dr Barbara Rolls and Robert Barnett. This book was first published at the end of 2000 but continues to be popular to date.